The most obvious, and indeed forward thinking, difference between the D7000 and the D7100 is the complete removal of the optical low-pass filter (OLPF) from in front of the sensor. These filters are traditionally used to help combat moiré patterning seen when photographing patterns or fine detail. However, the trade-off is that they also reduce the clarity, or sharpness, of your images and HD video. It’s similar to the trick Nikon pulled with the D800 and the D800E, except where they had two models, one with the filter and one effectively without a filter (D800 and D800E respectively), here there is just one model. Unlike the D800E instead of the filter effect being ‘removed’, it simply doesn’t have the filter fitted to begin with. You may feel that avoiding moiré patterns is a good thing and therefore the filter is worth keeping, however Nikon believe that the pixel density of this all-new 24.1megapixel DX CMOS sensor is such that the risk of moiré is substantially lower and therefore the benefits of increased sharpness and resolution win out. 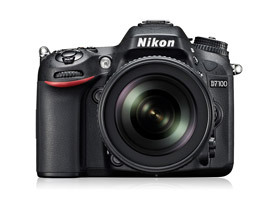 Beyond the resolution, the Nikon D7100 is able to shoot at 6fps in normal mode, or 7fps in a new crop mode. The DX sensor is normally APS-C sized, however this crop mode reduces the effective size of the sensor by 1.3x giving the equivalent of a 2x crop in 35mm terms, so a 100mm lens has the same field of view as a 200mm lens. The resolution is also reduced in this crop mode, dropping to 15.4megapixels. If you’re interested in wildlife or sports, or always find yourself wishing you had a longer lens, this may well be a great benefit. Another sign of the changes that have taken place under the hood is the new AF system. The D7100 uses the Multi-Cam 3500DX AF sensor that features 51AF points of which the central 15 points are cross-type for improved accuracy and focus speed. In another nod to sports and wildlife photographers, the AF sensor will function with a maximum aperture of f/8, so an f/4 lens with a 2x Extender is not a barrier to autofocus performance. The placing of the AF points has also been carefully thought out – when the 1.3x crop mode is selected, the 51AF points will cover a much larger part of the frame giving you flexibility in selecting AF points out to the edges, and equally improving subject tracking across the frame. HD Video is now firmly established as an important feature in every new DSLR and the D7100 is no different. A dedicated video recording button makes it quick to access. Video can be shot at 30p, 25p and 24p in Full HD (1920×1080) or at 60i and 50i if you switch to the 1.3x crop mode. 50p and 60p shooting are also available, but only at 1280×720. There is also an internal stereo microphone and a headphone port to allow live audio monitoring while filming – something that’s very important when recording audio on-camera. Another new, and very interesting, feature is the Spot White Balance option. While shooting in live view you can select a point on the screen and take a custom white balance from that area. If you’re using long lenses or don’t have a grey card to hand, this could prove very beneficial in achieving accurate white balance both for stills and movies. If you need to share your images with the world as quickly as possible, the D7100 can be attached to the optional WU-1a Wireless Mobile Adaptor. This allows you to share your images with a smartphone or tablet, or control your camera from the remote devices using an app available for Android and iOS. Rounding out the key features of the D7100, the camera shows its true aims with a robust construction that uses magnesium alloy for the top and rear covers and a shutter life tested to 150,000 cycles. The dust and moisture resistance is also much improved compared to the D7000 – Nikon are claiming it is to the same level as the D300S.